In fact, Dr. Alex Loyd says the Codes are actually MORE powerful when you do them for someone else, than if the person did them for him or herself. Love is the most healing force on earth, and the love that motivates you to do a Code for someone amplifies its power. 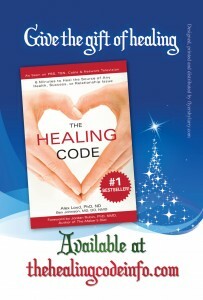 Wouldn’t the perfect gift be to give the gift of healing to someone with an issue you long to see healed? Perhaps it’s an illness or disease. I decided to offer something special: a Custom Healing Code session in which I’ll work with your loved one to pinpoint the source of the issue and get a Custom Code to heal it in the most powerful, targeted way. Custom Healing Codes are the most powerful Codes you can get because they are very specific to the person and the issue. Also, as a Certified Healing Codes Practitioner, I can help the person find any hidden or even generational memories that could be at the core of their deepest issue. Dr. Alex Loyd says that often a person will not fully heal unless the hidden or generational memory is found, if in fact that is the source. These memories are difficult to find on your own, and are usually the source of why a person doesn’t heal as quickly using the protocol in The Healing Code book or Manual. The holiday special I’m offering allows you to give a Custom Coding session to someone (including yourself), with or without The Healing Code book. I can either work with your loved one directly, or with you as you do the Code for them if you’re not sure they would do it for themselves. This year, give the best gift you can ever give: the gift of healing, mixed with love. Who knows, miracles may result! I am not an expert, but if you have the intention to sit down and take time as stated, then you should be able to get the result. It does work, but you need to put some time and effort in it. Have you tried using the Healing Code for this? It would address the underlying “heart issue” and whatever is “attached” to those heart issues. Getting a custom code from a practitioner might be a good idea, or at least starting with the Code in the book. If you were to work with a Coach, I suggest you have someone on the phone as well who can write down the custom code so you can do it, or have someone do it for you if that’s a problem. People can always do the Code for someone else, as it explains in the book and Manual. i have tremor in my hands i can’t write the doctor says i have essential tremor i take medication and i see i sleep more but no cure. The Healing Codes are for the purpose of reducing stress. “Essential tremor” is a medical description in which it is guessed that genetics play a part for about half of the diagnoses and the other half have unknown causes. Most people, even scientists and doctors, realize that stress triggers all sorts of symptoms which will end up being diagnosed as illness, diseases, syndromes, etc. Anything you can do to reduce stress can enable your body to heal itself. You might say that your body uses “God-force” or “Life Force” or “Spirit“, (or other words that you are comfortable with) to heal itself. Relaxation improves the access to this energy. Unhealthy Beliefs can keep the body in the stress mode. You can focus on feelings of being supported, being safe, a benevolent God eager to support your health and happiness, etc., as you do the Codes.